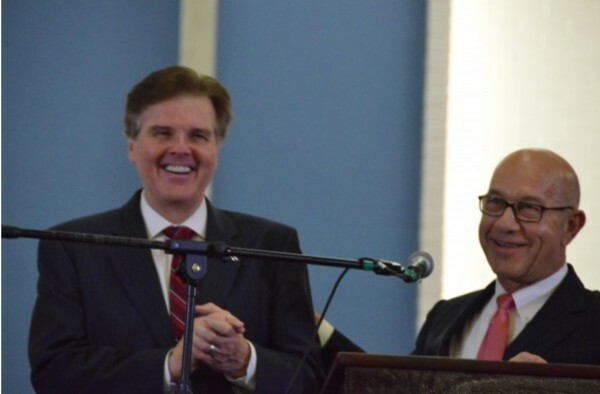 Two days before the historic first graduation of the Southwestern Seminary at Darrington, these two men held an historic press conference in the Texas Capitol in Austin. Lieutenant Governor Dan Patrick and Senator John Whitmire spoke to a roomful of press and media for nearly 30 minutes— about the forthcoming graduation at Darrington Seminary. Watch this press release to learn more of why they are smiling and why they came into the Darrington penitentiary on May 9, 2015, to celebrate the first graduation of the men in this four year, tough academic program. All 33 Graduates received their Bachelor of Science Degrees in Biblical Studies from Southwestern Baptist Theological Seminary. The program is entirely funded with private donations provided by the supporters of The Heart of Texas Foundation. We are grateful to these two men who saw the vision and helped Texas pursue that vision. The vision: to bring new levels of safety, forgiveness, and reconciliation to the Texas Prison System, to victims, and to families, and to the children affected by crime.